The Swan Hill municipality has more than 3900 kilometres of road, both sealed and unsealed. There is about 1300km of sealed road throughout the municipality – 872km managed by Council and the larger roads (425km) managed by VicRoads. Council aims to maintain a safe sealed local road system by carrying out regular maintenance, and continuing its program to extend, renew and upgrade the network. Each year Council reconstructs on average 4km of sealed road, reseals an average of 40km, and re-sheets about 25km of sealed road shoulders per annum. Council also aims to grade the shoulders on all sealed roads on an annual basis. The municipality has about 2600km of unsealed roads. About 1500km of that are ‘formed only’ roads. The remaining roads are ‘formed and surfaced’. Council’s highest priority gravel roads, collector roads and bus routes receive two grades per year, while the rest of the unsealed road network receives one maintenance grade per year. 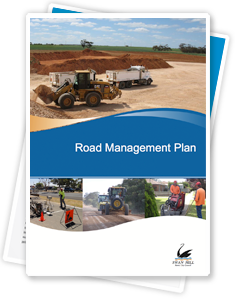 In addition to maintenance grading, Council re-sheets about 30km of unsealed road each year. There are many reasons that a local or arterial road might be closed. Road closures are advertised in local media and in the latest news – public notices on our website. If you wish to apply for a temporary road closure, please complete the Temporary Road Closure Application form below. Forms are also available from Council offices in Swan Hill and Robinvale. If you want to close a local road or use a road reserve for any event, work or activities, you must obtain a permit by submitting a works within road reserves application and read and consent to the road opening conditions. Examples of work that might require a permit include works within footpaths, nature-strips, driveways and extend to building hoarding. If your permit application concerns the installation of assets like irrigation pipes, electrical supply, water or sewage mains or other underground services to a property, you must also submit detailed construction plans to Council’s Engineering Services Department for prior approval. Any installation of private infrastructure (i.e. irrigation pipes) in Council’s roads requires the applicant to complete a Section 173 Agreement. Risk allocation in respect of the asset because it is located in, on or under the road. Once all parties have signed the document, it is the applicant’s Solicitor’s responsibility to lodge it with the Titles Office. Council will then be able to approve the Works within a Road Reserve permit. Please note: the Titles Office requires the document to be printed in single sided format (not doubled sided). If you are conducting an event, work or activity that relates to an arterial road, you must contact VicRoads for approval. Arterial roads include the Murray Valley Highway, Mallee Highway, Hattah–Robinvale Road, Donald–Swan Hill Road, Robinvale–Sea Lake Road and the Sea Lake–Swan Hill Road.